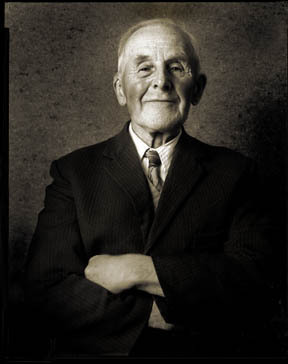 Billy Green (born 1925) took part in the Walkern Memories: 935 Years project and exhibition, having his memories of Walkern recorded by Janet Woodall and having his photo taken by local photographer Rod Shone, on 15 March 2007. As children we used to do gardening, take people?s potatoes home for them when they?d been dug up from the allotments, go beating, collect wood for fires, that sort of thing. After we?d finished we?d go to the pub and get a lemonade and a packet of chips as payment. Miss Cotton Brown was a good lady for Walkern and when she was gone they missed her. During the war if you had an acre of ground, or under, you had to plough it up for food; they made you plough it up. They also took all the iron railings from here for ammunition and most of the woods were cut down. They ploughed up all the pasture land around here during war time. I was involved in making parts for the machinery; the Girotiller, ploughing engines, up at Boormans in Cromer (it?s Buckles now). It was mostly pastureland around here before, also Brussels and potatoes; there used to be acres of Brussels around here. The growers from Bedfordshire used to hire the ground around here. Lots of the ground is good for potatoes. Bert Parker had pigs; he used to use the dung for the allotments next to the Yew Tree. The gate to the allotments is still there. Where the bungalows are down the side of the White Lion, Jack ?Eggy? Spencer used to keep chickens in there and we used to shoot the rats. It used to all be scrub in there, but they brought a soil tiller and grubbed it all out and Bill Warner used to dig it then ? he used to do market gardening.. The Dovecote up there at Peter Lincoln?s, the wood for that came from Hows Wood, as you go to Weston near Halls Green; the trees were brought into Cannings wood yard to be sawn. Before Canning?s went in 1981, I helped Jim Canning sort out some wood from that and it was used in the Dovecote. I still do beating for game shoots; I first started up at Box Wood; Sam Wackett at Eric Pearman?s farm. Shooting hasn?t really changed at all. They used to have two women shooters come up there from London. Box Wood was a syndicate shoot. They?d shoot pheasants, pigeons, hares, even moorhens ? you treat them the same as you do a young rook. People used to kill blackbirds and eat them; woodcock and snipe ? you have to be a good shot to get snipe! 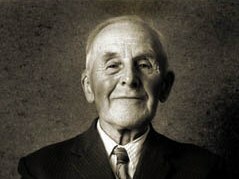 My husband is the grandson of Ebenezer Boorman -and worked for the firm between school & university. He remembers the firm from the 1940s on -what would you like to know?